CSIRO has launched a new diet which advocates for fasting and using meal replacement shakes to lose weight. It is a far cry from the Australian peak science body's whole-food-focused healthy eating pyramid. However, scientists have carried out research that shows intermittent fasting works effectively for people to shed extra kilos and stay healthy. On average participants lost 11 kilograms during the 16 week trial of the CSIRO's new Flexi Diet and saw improvements in their cholesterol, insulin, glucose and blood pressure levels. The diet, a collaboration with pharmaceutical company Probiotec, doesn't call for long stretches without food but rather modified fasting on three days each week. For three days you have two meal replacement shakes, light snacks and a high protein dinner. This alternates with control days where the shakes and dinner portion adds up to two-thirds the calorie intake of a normal day. On the final day dieters can eat or drink what they'd like. 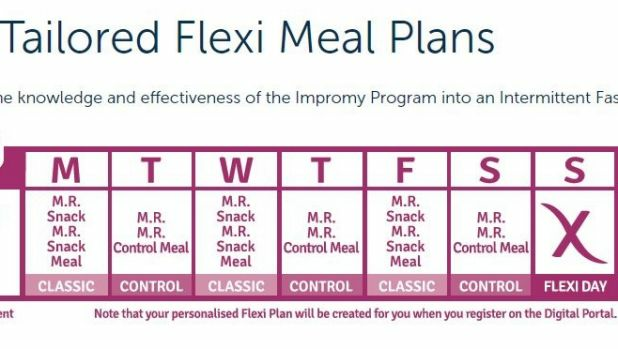 A meal plan example from the CSIRO Flexi Diet. CSIRO research dietitian Dr Jane Bowen said it was a national challenge that 13 million Australians could be obese by 2050. The program's new direction was motivated by the knowledge a one-size-fits-all approach to dieting was not working to curb obesity rates. The CSIRO research took a novel approach by analysing the longer term effects of intermittent fasting and comparing this to traditional diets based on continuous energy restriction. "It was very encouraging to see that weight loss and health improvements were similar for both diets," she said. "Having a very clear structured program we know makes a big difference to people's long-term success. The Flexi diet may be easier for people because they get a day off and they get bit of variation in how they structure their eating patterns." A CSIRO spokeswoman defended lending the organisation's name to the meal replacement company's product. "The 'I' in CSIRO stands for industry, and we've been working with industry for 100 years," she said. "With so many people in Australia interested in their health and wellbeing, there is a clear need for impartial, rigorous scientific method to validate the effectiveness of different weight loss styles. "In the context of our health and nutrition research, our intent is to clinically test dietary patterns that offer nutritionally balanced ways for losing weight. " Dr Bowen said pregnant and breastfeeding women, anyone taking medication or with pre-existing illness or those with blood glucose control problems should seek medical advice before changing their diet. Contrary to concerns fasting can be hard for people, the study had an 82 per cent completion rate with 135 of the 164 participants finishing the full 16 weeks program. Users, who can sign up to the diet at a pharmacy, have access to a recipe book and a website with personalised meal plans, progress tracking tools and a tailored virtual consultation designed by CSIRO dietitians and behavioural scientists.